Nobody wants to read old news. The content of your articles and blog post should be new, fresh and original. It should add something to all the junk that’s already out there on the internet. In this post, I’ll explain the importance of original content for SEO to you. In order to understand why original content is important for SEO, we should take a look at Google’s mission. Google’s mission reads ‘to organize the world’s information and make it universally accessible and useful.’ So, in order for Google to rank your content, you should write something that is accessible and useful for your audience. Your information should add something to all the other information on the internet (about a certain topic). It should offer your audience something that is not offered in other blogs, articles or websites. If you want to write original content, you should think about your audience. What do you want to tell your audience? What’ll be the main message of your article? And what is the purpose? What do you want your audience to do after they’ve read your article? Do you want them to engage, to buy your stuff, to read more posts? Thinking about these questions will help you to come up with an original idea for your post or article. Although an original idea is a key element of writing an awesome and SEO-friendly article, every SEO strategy should start with proper keyword research. If you want to rank and to attract traffic to your site, you should focus your SEO strategy on those terms that people are searching for. You should try to get in people’s head and figure out which words they use for their searching. What questions do your audience have? There are a number of tools you can use to help you with your keyword research. If you execute your keyword research properly, you should end up with a long list of terms you want to be found for. This list should function as a guide for you to choose from. You should write content surrounding these keywords. A keyword is not yet a topic, though. You should make sure to come up with an original idea for your blog post. An idea in which the desired focus keyword could have a prominent place. Writing original blog posts is the best way to drive traffic to your website. Providing you’ve done your keyword research well and you’re going after the terms that drive traffic to your site, original content can be a real boost for your rankings and your business. Above that, it’s a great way to show expertise in your specific niche to your audience. A great example of a blog with original content is the blog of Marike de Valk. Marike is a couples counselor (and my mother-in-law). She writes blog posts about relationships. Her posts show her expertise and authority in couples counseling. And -she knows which terms to tackle- generates lots of traffic and business. 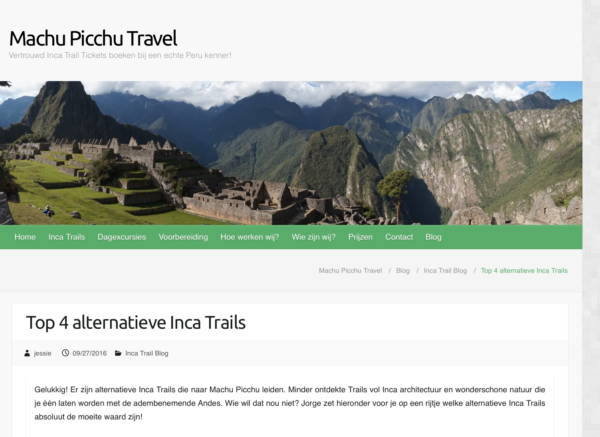 Another great example of a blog with original content is Machu Picchu Travel. This site is owned by a Dutch woman and her partner (who is actually from Peru). They recently started selling tickets to the Inca Trail. As one of the owners of Machu Picchu Travel used to work as a guide on the Inca Trail, they have lots of stories, tons of beautiful pictures and all kinds of inside information to share with their audience. They started blogging some time ago. And that seemed to pay off! They attract more and more traffic to their website and sell lots of tickets (although they just started out!). 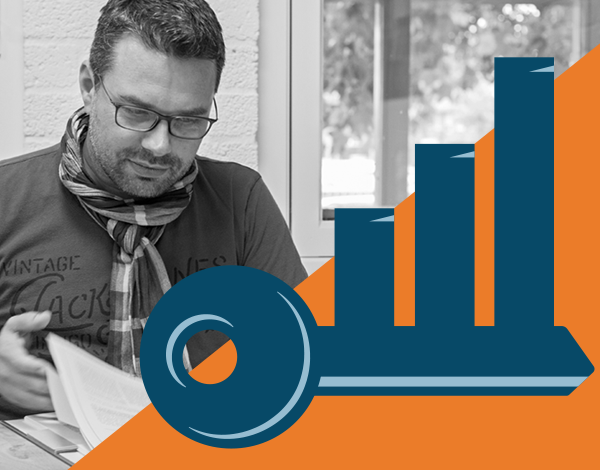 Your keyword research will thus give you ideas on what terms your articles should be focused. After that, it’s your job to write something original surrounding that specific keyword. It can be tempting, though, to write something that’s similar to what’s already been written by all these other bloggers. 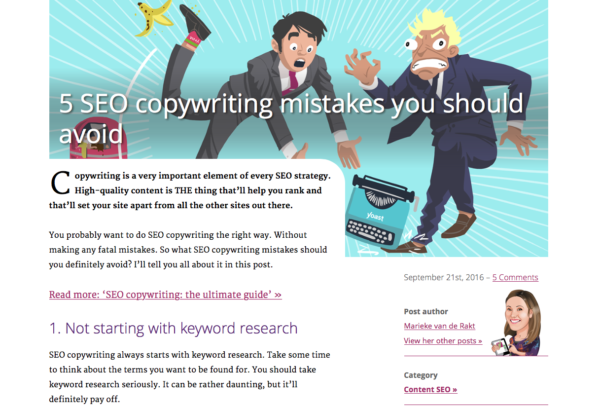 A few weeks ago, the Yoast SEO team (yes, we have our very own SEO team) asked me to write something about SEO copywriting mistakes. The keyword ‘SEO copywriting mistakes’ is a keyword of which we think it will drive traffic to our site. I wrote the article and gave it the title : 5 SEO copywriting mistakes you should avoid. A very clickbaity title. I’m sure my article will rank and I’m also sure that people will click on that title. However, the post was not original. One of our readers commented on this post and mentioned the unoriginality. He was right. There are about 20 lists with SEO copywriting mistakes out there. And although at least two of my tips aren’t in any of the other lists, the post still was (a bit) unoriginal. Writing such a post every once in a while is fine and could help you generate clicks on the SERPs. However, if your content is unoriginal all of the time, your audience won’t come back to read any more of your posts. Original content is the first thing you need to focus on in the process of writing a high-quality SEO friendly blog post. After you’ve made sure you have original content, you should focus on the readability of your post. Your idea could be totally original, but if you’re unable to write a decent text, your message will get lost. So, definitely make sure to write a text that is both easy as well as nice to read!